CocoaNav JS is a light version of CocoaNav. It's faster to use as the class list is static (dumped from CocoaNav), but also less powerful as you can't search methods or protocols, only classes. And sometimes it's beachballing and looking like it will crash Safari, but I assure you it won't ! Just let it run. 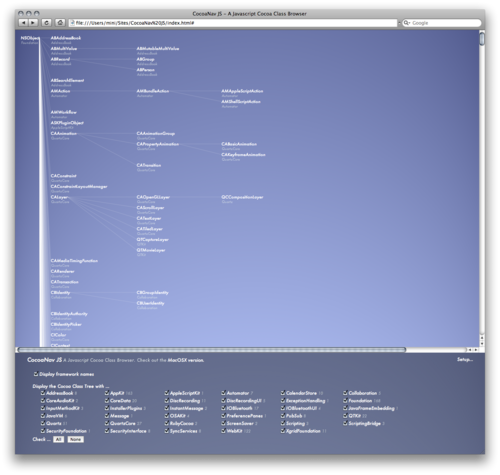 CocoaNav is Leopard only, and I see Tiger users and Windows users checking the page out :) If you're one of them, this will give you a quick way to discover the Cocoa Class Tree, each class having a link to Apple Developer. EDIT : turns out that slowdown occurs when I set the canvas's dimensions. I use it to draw lines between classes. On my Mac the layout produces a 1198x16000 table, the canvas is overlaid beneath and sized to cover it all. If Safari allocates one big plane, that comes up to a 73 Mb RGBA surface. Anyone got any canvas tips, or a better way ? I'm just drawing lines here. Works best in Firefox 3. I just tested Webkit's nightly, it still locks up for up to 30 seconds in some cases. Firefox will just take 1-2 seconds to redisplay.